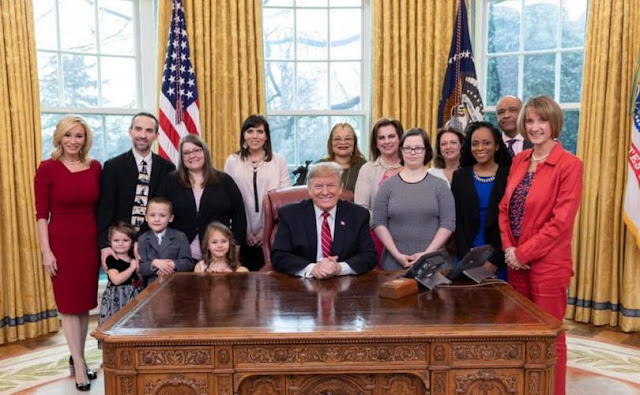 On Valentine's Day President Trump met with several pro-life advocates. Most importantly he met with abortion survivor Melissa Ohden and the pro-life niece of Dr. Martin Luther King, Jr. - Dr. Alveda King. These are the words that I spoke to President Trump as I shook his hand in the Oval Office on February 14th, 2019. Although our time with President Trump was limited, I had the great opportunity to share with him that I survived a late-term abortion, and then sit in on his phone call to pro-life and faith leaders from across the nation. If you were part of that call, you know that President Trump voiced his ongoing commitment to life, condemned the legislation being passed across the nation that’s aggressively anti-life, and he also denounced Virginia Governor Northam’s comments on infanticide. "....this is just the first step in having survivors acknowledged, included, and supported by the Trump administration and maybe even our greater culture. Dr. Alveda King, niece of Dr. Martin Luther King, Jr., was also present she is the founder of King for America, Inc., consultant to the Africa Humanitarian Christian Fellowship and Pastoral Associate and Director of African-American Outreach for Priests for Life and Gospel of Life Ministries. Alveda King was very moved by the meeting and exhorted everyone writing: "Let’s do something different today. Let’s pray for America, and join President Trump in his compassion for the least of these exemplified in his speech yesterday. Let’s choose adoption as an option to abortion. Let’s insist that our elected officials not support infanticide."